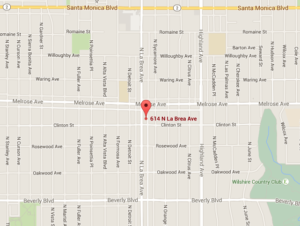 Our parking lots are located at Melrose Elementary, a 3 minute walk from the theater. enter on Waring Avenue, between Formosa & Detroit. enter on Detroit Street, just north of Melrose. 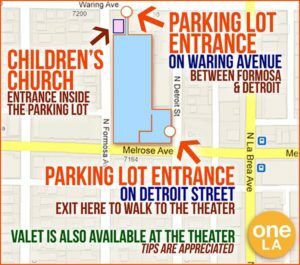 Valet service is available at the Theater for $10/car. *As a courtesy to our neighbors, we do not recommend street parking. Strict parking restrictions are enforced.